Pierre Bouilloux, a hang-gliding instructor. At the time, his passengers fainted in flight due to pressure points. He began to tinker with his harness to improve the comfort of his customers. He bought his first sewing machine in 1979. NEO is a manufacturer of Paragliding and Speedriding equipment. NEO has made the choice to manufacture in France with European materials. More than a choice, it is a challenge, strong of convictions, which can not be realized without the support of the customers adhering to our values. Gin has been designing paragliders since 1986. It is supported by such experienced teams both in its workshops and around the world through a professional network of distributors and resellers. Passion is the best starting capital. Since its inception 27 years ago, ADVANCE has always placed the needs, desires and emotions of the pilot on the front of the stage. Kortel Design is based in Sallanches, at the foot of Mont Blanc and a short distance from Chamonix. Kortel Design was created in 1998 by Denis Cortella, three times French champion paraglider pilot. 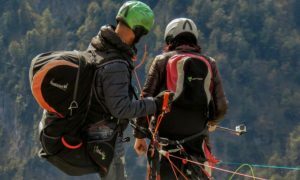 Thanks to the arrival in 2006 of Max Jeanpierre, second in the Paragliding World Championships overall in 2005, the range of products has been expanded to match to most paraglider pilot requirements.